Here at Balladeer’s Blog I am still having the time of my life watching all of the white collar criminals called Democrats and Republicans rolling on each other. The latest is former DNC Consigliere Donna Brazille, the ABC “News Woman” (LMFAO) who admitted to feeding Hillary Clinton advance questions going into the televised debates last year. Donna succeeded Hillary Clinton stooge Deborah Wasserman-Schultz as Consigliere and she has her own book out now about Clinton and DNC corruption. It will come as no surprise to my fellow aficionados of American “tell-all” books about political corruption that Brazille’s work is the typically self-serving wallow.
. … … “Hey, big SPEN-DERRRRRR!” … … . You have got to love the HILARIOUS news about the way bribes funneled to career criminal Hillary Clinton via her fake charity are drying up completely now that she was defeated in her attempt to steal the presidency. What better time to ponder possible titles for the inevitable exercise in hagiography that Hillary’s clueless and uninformed Hollywood worshippers will no doubt concoct? 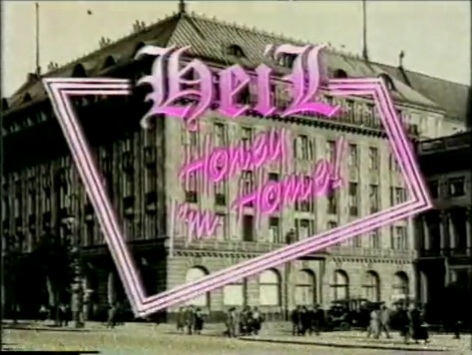 To paraphrase master satirist Stan Freberg’s ad line for Hogan’s Heroes let me just say “If you liked World War Two you’ll LOVE Heil Honey, I’m Home! The premise of this study in cosmic-level bad taste makes it sound like a comedy sketch lampooning the staggering callousness of television executives. Or maybe like a Springtime For Hitler– style moment from a satire on television’s desperation for getting ratings through calculated outrageousness. Unfortunately this program was an honest-to-God attempt at launching a sitcom in the U.K. in 1990. Eight episodes were filmed but after the pilot aired for this failed attempt at dark comedy the ensuing outcry ensured the show’s immediate cancellation.